Please note, this application is for PiXL school members only and you will need to get your school id from your teacher if your school is a member of the PiXL club. 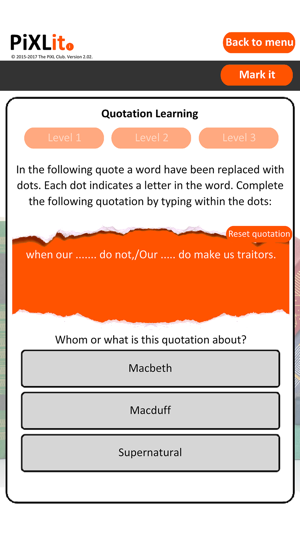 The PiXL English App (PiXLit) is a quote/text based assessment program. 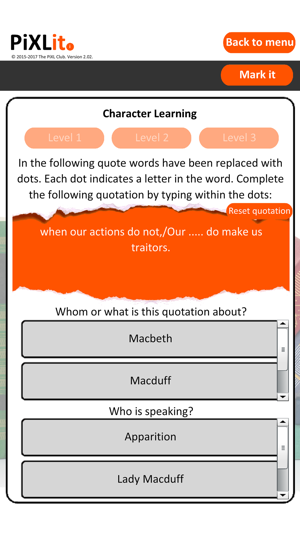 The app successfully highlights your strengths and your areas to develop from looking at quotes from different texts. 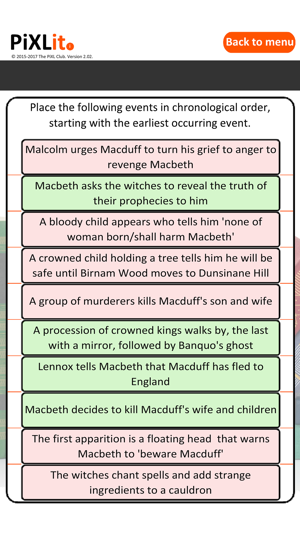 This is a very useful and accurate tool to use prior to any test to help rank what needs to be revised. Information passed to staff is displayed in a meaningful way and exportable in multiple report formats (pdf and csv). (c) 2018 PiXL Club Ltd. All rights reserved. PiXL Club Ltd ("PiXL") endeavour to trace and contact copyright owners. If there are any inadvertent omissions or errors in the acknowledgements or usage, this is unintended and PiXL will remedy these on written notification. Staff scoreboard now includes a toggle between engagement points and achievement score. Staff can edit the points of individual students now through "Edit a student" under "Class admin". 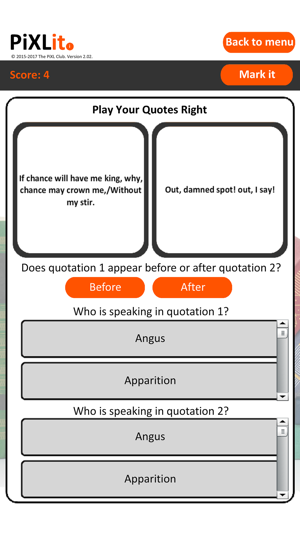 Students can now link their English App account to their Maths App account (editable under their profile). Eventually students will be prompted to use their Maths App account details to access all apps. For now the link is being made. Me and my wife used to always argue over who would have to do ‘question 4’. This was bad, the relationship between my wife was quickly descending into kill or be killed. But then I found this app and we have got much better. We no longer argue and we long to do the amazing essays available by pixl lit. Thank you pixl! Whilst using the app I have encountered numerous bugs that have lead me to reopen the app and have lost my progress. 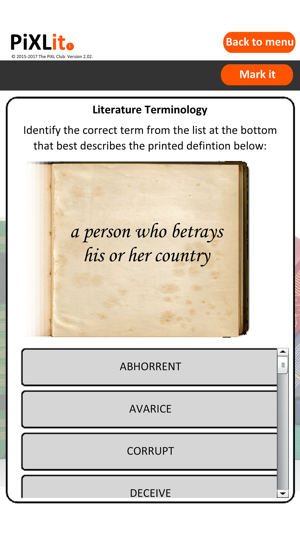 I also found that on the ordering of events as you are answering the question it shows you whether you are right or not which just makes it pointless, you shouldn’t be able to see the correct answers until you confirm your answers. It would also be nice for the app to have tighter integration with iOS. The Pixl Maths app works much better so I am disappointed to find this app to be so poor. I want to mate with the man who made this! Pixel lite is a great film that pushes the gender boundaries and puts feminism on a pedestal. My Dad likes to beat me on a night and this app is my only escape. I made a Fortnite creative mode map after it. My Mum works in the pixel lite department and is sexually assaulted by her 40 year virgin boss, Prince Phillip-in. Thanks Pixel Lite for been my long lost family! ?